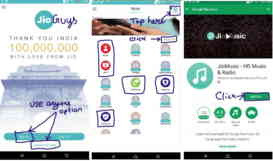 How to Install All Jio Apps Quickly Using MyJio App? Jio has more than 12 apps in Google Play store and iTunes. While it is not mandatory to install all the apps, you can install the apps you prefer manually. What if you need to install all the applications back to back without searching manually? Here is the solution. The MyJio app has the option. Sign in with SIM or User ID and Password. The list of Apps will be displayed. Apps already on your phone will be highlighted and not installed will be blurred. Locate "Install All" link. It is available in the right side top corner under the Jio Apps logo. Click on it. You will be taken to Google play store. Clik to Install the suggested apps. After installing one application, you will be prompted for installation of next application. Please ensure that you have enough disk space on your phone. If not, the download will be interrupted. Hope you have installed all the application on your phone. Please let us know how this guide helped you. Did you face any challenge while installing the Jio Apps? What is your experience in installing Jio Apps? Looking forward to your valuable comments.